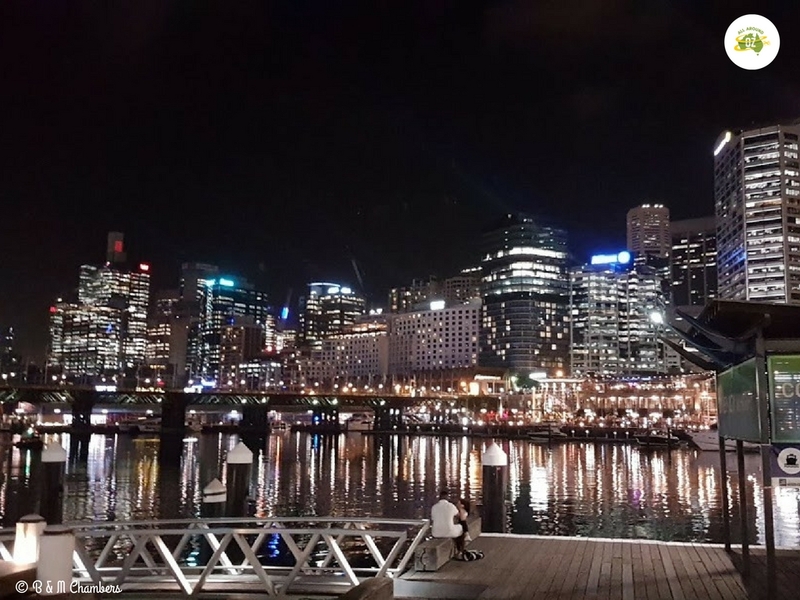 On my recent trip to Sydney, I spent most of my time around the Darling Harbour area. I love this area of Sydney as it has so much to offer. It is central to everything, has fantastic views, great places to eat and loads of things to do. There is something magical about Darling Harbour at night. If you have ever wanted to learn a little bit about Australia’s maritime history then a visit to the Australian National Maritime Museum is a must. This wonderful museum is so well laid out and showcases our maritime history right back to the 1700’s. Best of all, the inside display is free. Outside there is a submarine, naval destroyer, a patrol boat and a replica of the Endeavour. Entry on to these will cost just $79.00 for a family of 2 adults and up to 3 children aged 4 to 15. Displays inside the museum include Kay Cottee’s boat, First Lady, that she sailed solo around the world in and also a navy helicopter. There are also displays of naval activity during the Second World War. 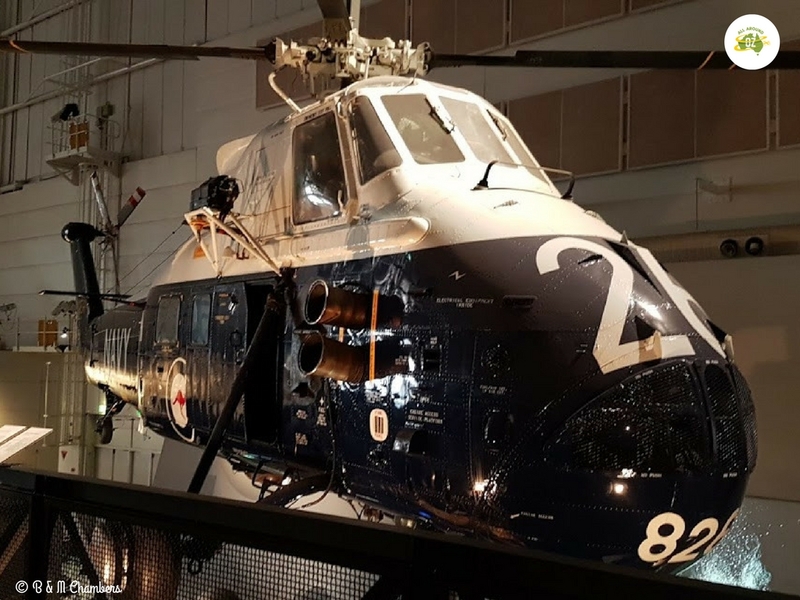 This Wessex helicopter hangs from the roof of the Australian National Maritime Museum. Whether you are in the market for a new outfit or want to find a gift to take home chances are you’ll find it inside Harbourside. It’s also the perfect spot to head when you get a bit peckish. You will find everything available from take-away to fine dining. There is a large food court in the centre with sushi, burgers, kebabs to name just a few available. If you fancy dining with a water front view there are plenty of places along the outside to check out. Other spots that are great for the family are Hard Rock Cafe, Grill’d and Rashays. For an after dinner ice cream treat I highly recommend Andersons of Denmark. Very yummy indeed! At anytime of the day this area is very busy. There is even a ferris wheel out the front which has stunning views of the water and the city. The views of the city from Darling Harbour are nothing short of spectacular. This area is located on the eastern side of the Darling Harbour precinct and is the perfect spot to enjoy ‘happy hour’. In fact nearly every restaurant/bar that I walked past had signs out advertising happy hour. Cockle Bay Wharf is my favourite spot to sit with a drink in the late afternoon and people watch. And if you run out of happy hour time you can always stay for dinner. 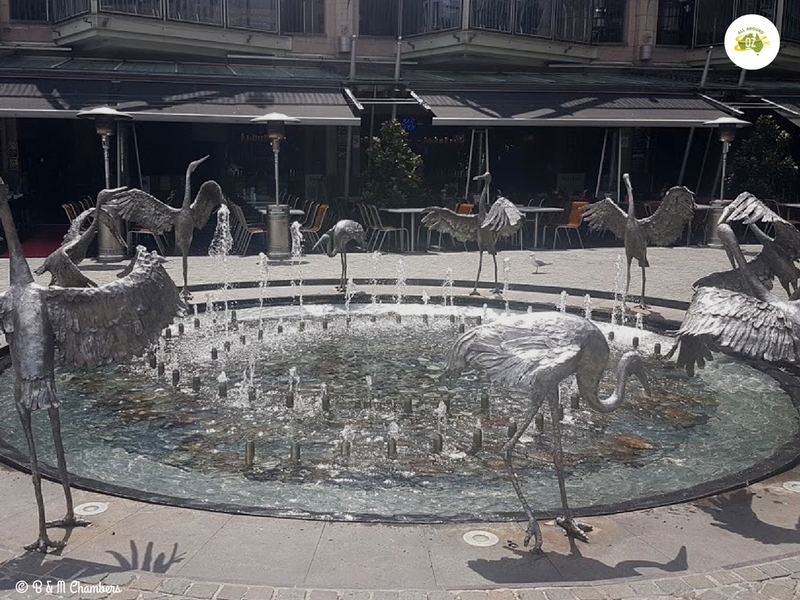 I found this fantastic fountain in the middle of Cockle Bay Wharf. I love walking from the city side of Darling Harbour across the historic Pyrmont Bridge. Pyrmont Bridge is one of the world’s oldest electrically operated swing span bridges. The current bridge opened in 1902 and was restored in 1988. It still opens occasionally to allow tall ships to pass underneath, but is more used as pedestrian access. With the removal of the monorail in 2013, the easiest way to reach Darling Harbour now is to utilise the Sydney Light Rail. The light rail starts at Central Railway Station and now runs right the way through to Dulwich Hill. More routes are currently being added and will take in George Street and Circular Quay. 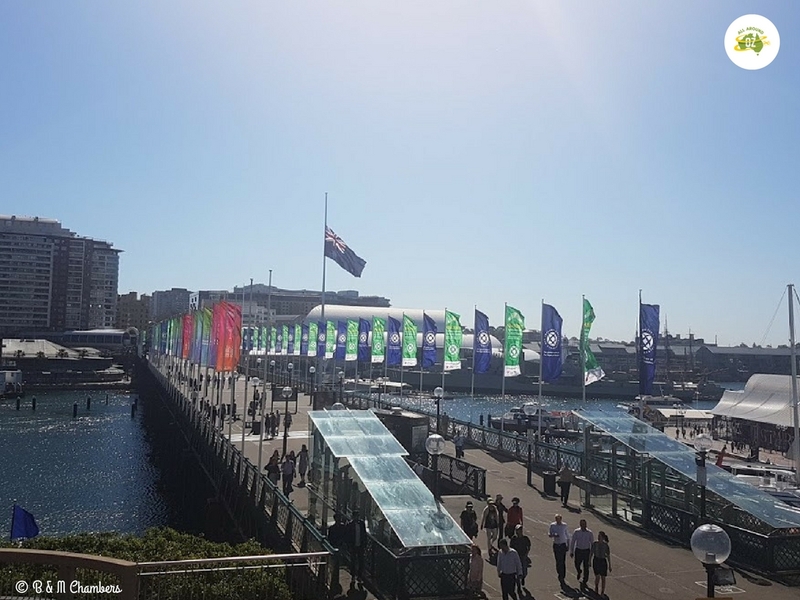 Convention is the station to alight at for Darling Harbour and then it is just a very short walk and you are in Darling Harbour. The easiest way to to travel on the light rail (or any of Sydney’s public transport) is to purchase and Opal Card. You can purchase them at railway stations, newsagents, corner stores and even at Woolworths. I put $35.00 on mine initially to get me from the airport and then topped it up with a further $10.00. This got me around for the four days I was in Sydney. I won’t lie…..accommodation in Sydney is expensive. So once again we opted to stay at an Air BnB. My friends that I was staying with found the best apartment in the perfect spot. 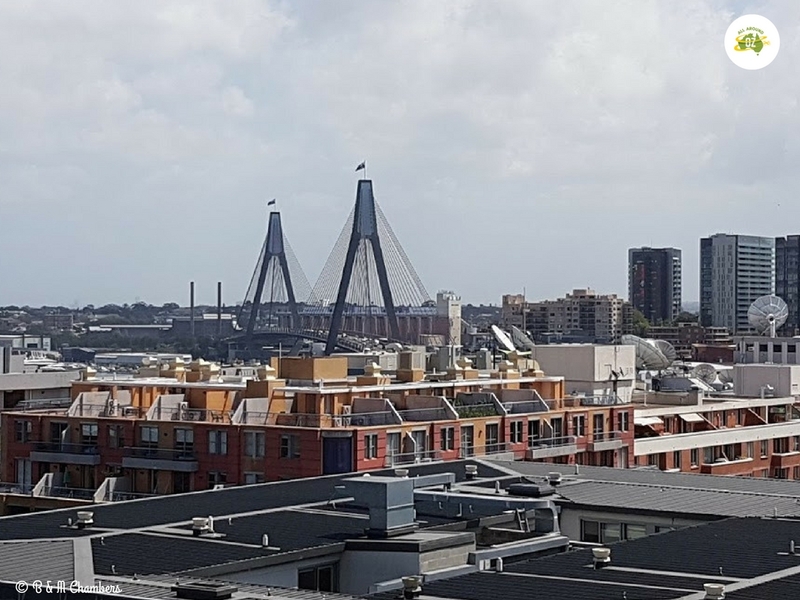 Located in the Oaks Goldsbrough building our apartment was spacious and had a balcony with a fab view of Anzac Bridge. It was just a short five minute walk to Darling Harbour. The Oaks Goldsbrough building is a heritage listed building from the 1800’s. When it was turned into apartments in the early 1990’s many of the original features were retained such as the timber floors and enormous wooden support beams. Very impressive indeed. Booking through Air BnB made this an affordable place to stay. I doubt we would have stayed in this particular spot otherwise. This was just a small section of the amazing view from our balcony. There are many other attractions located close to Darling Harbour that I didn’t visit on this occasion. The Sea Life Sydney Aquarium, Madame Tussauds Wax Museum, Wildlife Sydney Zoo and also the Powerhouse Museum. 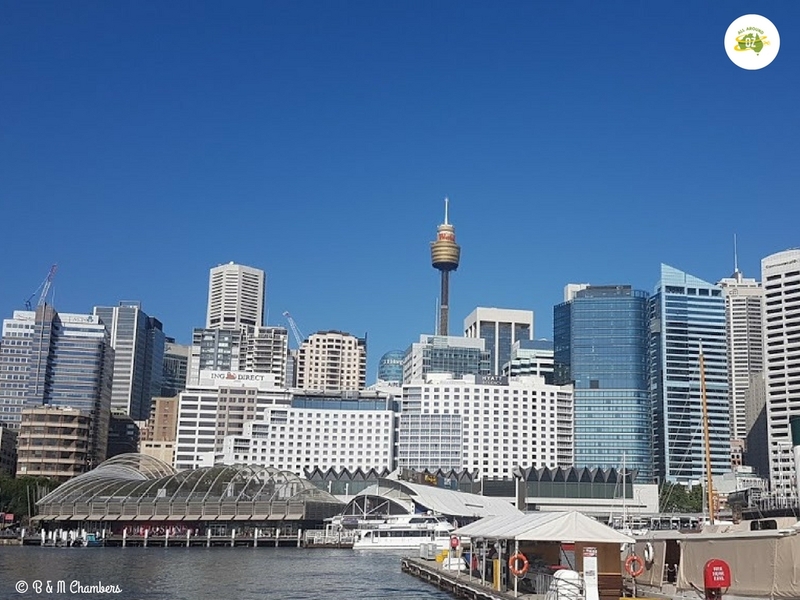 Star City Casino is a short light rail ride away and Darling Harbour is also the starting point for many of the Harbour Cruise companies that operate in the area. If you want to explore the CBD, the Queen Victoria Building and the Pitt Street Mall are also just a short walk away. I’ll have to check out the Harbourside Shopping Centre when i’m around the area again. I love Darling Harbour. My cousin used to live in that area just behind the casino so I had a easy access to free accommodation. Awesome! What an awesome spot to live. I would love to live in the middle of Sydney….just for a little while. I’ve always loved Darling Harbour. Always something to look at and so many great places to grab a drink or something to eat.